"In fact, you're better off in Kansas nowadays." Don't laugh. Lawrence, Kansas, has been a hotbed of alternative music for several years, thanks principally to the indefatigable Bill Rich, who runs the hardy, little Fresh Sounds label there. As far back as 1981, Rich was issuing the first pressings by the Lawrence bands Get Smart! and the Embarrassment, both of whom went on to underground-cult fame. 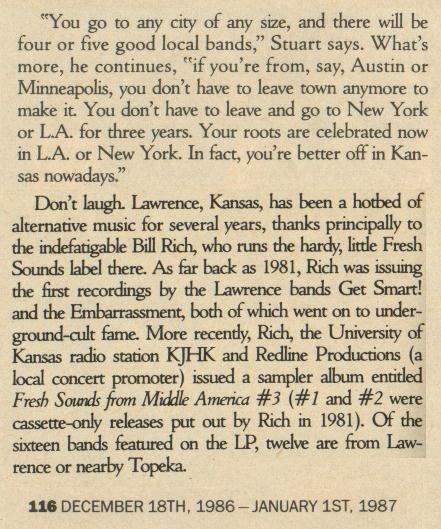 More recently, Rich, the University of Kansas radio station KJHK and Redline Productions (a local concert promoter) issued a sampler album entitled Fresh Sounds from Middle America #3 (#1 and #2 were cassette only releases put out by Rich in 1981). Of the sixteen bands featured on the LP, twelve are from Lawrence or nearby Topeka. From the article "The Underground Empire" by David Fricke, published December 18th, 1986.